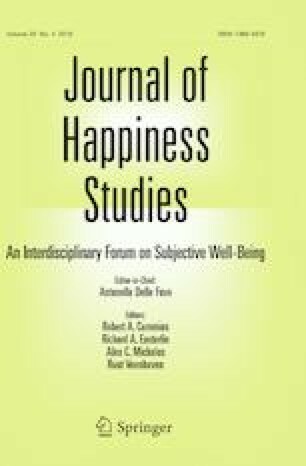 Several strategies for decreasing anxiety and increasing subjective well-being have been tested and found to be useful, such as downward social comparison, loving-kindness contemplations, and interconnectedness contemplations. These, however, have not often been directly compared. Emerging adults contemplated one technique for 12 min while walking around a building. Those who wished others well (loving-kindness) had lower anxiety, greater happiness, greater empathy, and higher feelings of caring and connectedness than those in a control condition. The Interconnectedness condition resulted only in beneficial effects on social connection. Although social comparison theory suggests that downward social comparison should improve mood, this study found that it had no beneficial effects relative to the control condition and was significantly worse than the loving-kindness condition. This brief loving-kindness contemplation worked equally well across several measured individual differences, and is a simple intervention that can be used to reduce anxiety, increase happiness, empathy, and feelings of social connection. This study was not funded by any external agency. The authors declare that they have no conflicts of interest to report. All procedures performed in studies involving human participants were in accordance with the ethical standards of the institutional research committee, in accordance with American Psychological Association ethical standards, and with the 1964 Helsinki declaration and its later amendments. Informed consent was obtained for all participants. Loewen, P. J., Lyle, G., & Nacheshen, J. S. (2009). An eight-item form of the Empathy Quotient (EQ) and an application to charitable giving. http://individual.utoronto.ca/loewen/Research_files/Eight%20Question%20ES_final.pdf. Accessed 20 Mar 2019.